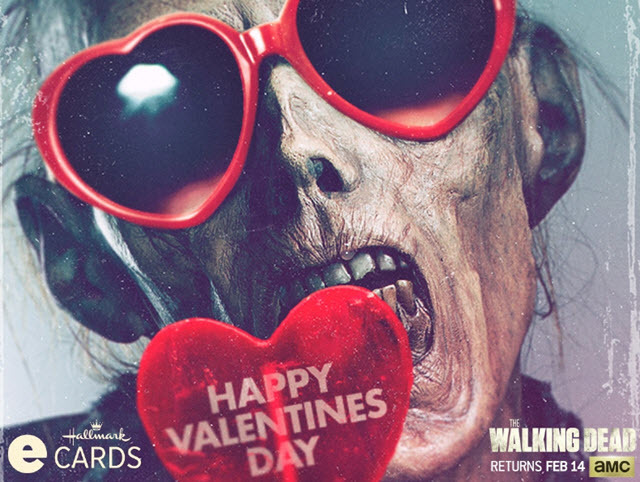 Hallmark has partnered with AMC's The Walking Dead for a line of Valentine's Day ecards. The humorous cards features the signature walkers from The Walking Dead horror series. A walker is wearing heart-shaped sunglasses in one of the ecards. Christine Taylor, Licensing Creative Account Manager for Hallmark, says in a statement, "We're excited about this new partnership with AMC to promote the highly anticipated midseason premiere of The Walking Dead, while helping fans have some fun with the holiday. We thoroughly enjoyed finding ways to juxtapose a show like The Walking Dead with the tradition of Valentine's Day to create new eCards offerings." The cards include sayings like "Beauty Over Brains, Love You to Pieces" and "Eat You Up." The free cards will be available now through Sunday, February 21st.